How is stomach cancer staged? The most common staging system in North America for stomach cancer is the TNM classification system. In the TNM classification system "T" refers to tumor characteristics. A tumor is given a score from T0 to T4 based on how many layers of the stomach are invaded by the tumor. A lower score is given to a tumor that invades only the innermost (superficial) layer of the stomach wall, while a higher score is given to a tumor that invades the outer (deeper) layers of the stomach. "N" refers to the number of lymph nodes that contain cancer cells. Stomach cancer is scored from N0 to N3b depending on the number of lymph nodes invaded by cancer and their closeness to the stomach. A "regional" lymph node means that the lymph node is near the stomach region. A tumor can spread (metastasize) from the stomach to other parts of the body by the lymphatic system and its blood supply. Lastly the "M" refers to whether the cancer has spread to other parts of the body and is scored from M0 to M1. 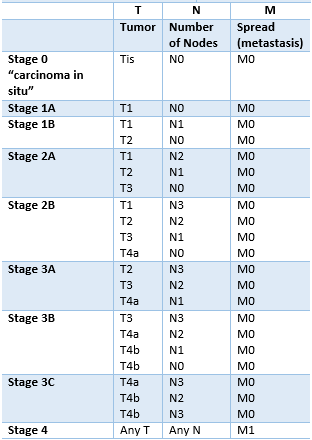 The information about tumor characteristics (T), number of lymph nodes affected by cancer (N) and the degree of spread (M) are combined and the patient is given a final stage from stage 0 to stage 4. To see how T, N and M are combined into a final stage, see table 2 below. Table 2. Information about TNM are combined and the patient is given a final stage. The patient can have any of the above combinations.